Boxing and sports betting have had a love-hate relationship throughout history. Rumors of fixed boxing matches and crooked promoters have at the same time hurt the reputation of boxing and also cemented the sport as one of the most interesting public events in the world. Big boxing matches today still generate massive audiences and are broadcast live to millions of homes. 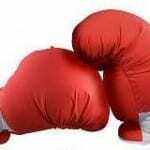 Boxing betting websites have taken the idea of boxing betting to the 21st century. Today, people can watch big time boxing matches in real time and place wagers on those boxing matches from the comfort of home. No longer is it necessary to visit Las Vegas bookmakers or deal with local bookies who may or may not pay up when you win big. Every online sportsbook offers boxing betting to some extent. At the very least, betting websites offer wagers on highly publicized fights that generate big ticket sales. At the best boxing betting websites, you’ll find boxing betting opportunities on all sorts of fights. Sometimes you can even place wagers on whether or not a certain matchup will ever happen. There are two major things we look for when choosing which boxing sites to recommend: safety and betting options. As far as safety goes, that’s something we are very hard-headed about. Online boxing betting requires trust and we only bet at sites that are trusted by the betting public. When there are so many reputable boxing betting websites out there, it just doesn’t make sense to bet at anyplace that hasn’t already proven itself to be a safe betting site. Betting options are also important because there are a lot of betting websites out there that have a paltry selection of boxing betting options. There are tons of boxing matches that you could potentially bet on out there, but some betting websites only provide betting options on the very biggest boxing matches. We prefer to have new boxing betting options every day of the week. A few other things that we look at in boxing betting websites are variety in the types of bets that are offered, the generosity of the boxing lines, the number of deposit options that are available and how easy it is to cash out winnings. All of these things taken together can either create an awesome boxing betting experience or one that is barely worth mentioning. Online boxing betting takes place at large betting sites that have many different deposit methods available to their customers. These deposit options are used to help new customers fund their betting accounts and later to help customers cash their winnings back out. The most popular deposit options at betting sites can be organized into a few different categories. First of all, there are instant deposit options such as credit cards, debit cards and e-checks. These deposit methods can be used to transfer money straight from your bank account to your betting account. The whole process takes less than five minutes from beginning to end and your account is credited with the money instantly. Next, there are e-wallet deposit methods such as Neteller, Moneybookers and Click2Pay. These online services let you set up virtual accounts in which you can store funds online. With an e-wallet account, you can deposit your money at any online betting site. When you’re ready to withdraw your funds from your betting site, they will be sent straight back to your e-wallet account. Finally, there are other random deposit options such as prepaid gift cards, cash transfers and bank wires. Each of these deposit options has its own advantages and disadvantages. Cash transfers and prepaid gift cards are great for people without bank accounts, for example. Wire transfers are useful because they are cost-effective for large deposits. Boxing betting on the internet works in a similar manner to boxing betting at traditional bookies. However, the internet tends to offer a greater variety of betting options for every match. The biggest betting websites usually come up with an interesting variety of bets during major boxing matches. In this section, we will explain a few of the most popular types of boxing bets. This is the most basic type of boxing bet. In a boxing moneyline, you try to pick which boxer will win an upcoming fight. The bookmaker adjusts the odds for each boxer in order to make both boxers worth considering. The underdog boxer is given higher payouts while the champion is given lower payouts. Boxing totals are wagers on how many rounds the match will last. In these bets, the bookmaker chooses a number of rounds and then you can wager on whether the fight will last more than that many rounds or less than that many rounds. Bookmakers often set the rounds total at a half mark (9.5 rounds for example) to reduce the possibility of the match lasting exactly that many rounds. If the match does end on the exact total number of rounds set by the bookmaker, all bets are returned to the customers without any winnings or losses. These wagers are a bit more difficult to win but they offer higher payouts. If you are very knowledgeable on the sport of boxing, fight outcome bets can be a great source of money over the long term. In round betting, you predict which fighter will win the match and in which round the fight will end. This bet is one of the most difficult types of boxing bets to get correct, but it offers some significant payouts to winning bets. Depending on the fighter and the round, payouts can get as high as 100-1.